With the Peek™ Plus Baby Internet Monitor System you can enjoy peace of mind anywhere, anytime with the ability to view your baby on all your digital devices, including smartphone, tablet, or laptop. 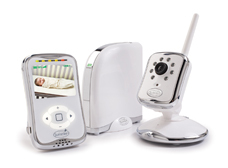 Peek Plus lets you view your baby in-home, using the included handheld monitor, as well as on the Internet, via a private and secure website. Peek Plus comes with a plug & play Internet gateway and a camera that are simple to set up and easy to use. A free, downloadable app is available for iPhone, Android, and Blackberry.